Palawan is a paradise. This is also a place where no earthquake will occur (check the web for more further knowledge). I have never been to Palawan and i dream to be there someday. Palawan is a home for two UNESCO heritage sites. Palawan is in the Philippines. Palawan is a wonder in the Philippines and in the world. These are just the reason why Palawan is Palawan. An episode of MMK is the primary reason of making this post. Yes i know i know, most of my posts are inspired by television shows, most of it are documentaries. But, i believe that the topics that i featured from such TV shows and documentaries has sense and worth blogging for the Filipino and the world to know. The episode is about a woman who fight for the halting of a mining company in Palawan. (it seems like i am telling the plot here). The woman got blind, though her disability didn't stop he to pursue for the closure of the mining company. What's bad is the governor is in the side of the mining company because he said that the company gives employment. According to her, this employment is just temporary. Mining will cause more troubles in the long-term, which is true. The mining caused skin diseases to the residence because of using the river's water, so means that the river itself is contaminated by chemicals. Rice farmers also got affected by the mining because the soil is contaminated and planting of rice and other plants will sooner be impossible. These are just some of the effects of mining in Palawan. I don't think that we have to wait for more of the bad effects that will occur until to stop the mining. Have you heard about Dr. Gerardo "Gerry" Ortega who were killed because of his contradiction publicly of mining in Palawan? Now, let's all make a move by signing up against the mining in Palawan, By signing your signatures, this will be a great movement and help to the environment, rice farmers, to Palawan wildlife, to Palawan, to our country and to those who sacrificed their lives. CLICK HERE for your signatures in stopping the mining in Palawan. Spread the word and let's all gather signatures! 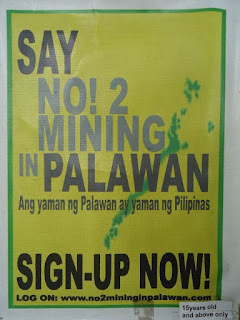 I am not against mining dahil marami tayong pakinabang sa pagmimina. Kung walang minahan eh wala tayong bakal na gagamitin. Kung walang minahan eh hindi aandar ang ekonomiya. Ang tinututulan ko lang ay ang style ng pagmimina na nakasisira sa kalikasan. Cheers! Signed for the petition a long time ago na dahil sa barkada ko. Yay! This is the least I can do, so yeah, BRB, signing up! I clicked the link pero ayaw mag load ng page. I'll try again later para makapag sign din ako. Thanks for sharing this!